When it comes to understanding your student’s stress, communication is key. Aim to understand what is causing stress in your student and how it affects them individually. Sometimes stress can manifest as physical symptoms, such as stomach pains or headaches. Other times, stress can make your student shut down or withdraw. Once you have initiated an open line of communication with your student and have a better understanding of their stress, work together to develop coping strategies. Maybe there is a particular song or musical group whose music helps them feel calm. If this is the case, encourage your student to listen to this song before school, in study hall (if allowed), or during study breaks. Are your student’s classes too hard? If so, inquire with your student’s teacher if there are extra credit opportunities, or seek out a private tutor to reduce stress. Are your student’s extracurriculars impacting their academics? If so, ask your student if any of their extracurriculars are causing stress. Eliminate any if necessary, or scale back depending on the activity’s demands. Does your student get overwhelmed during study time? If so, try structuring homework time differently and manage their time depending on what their stressors are. For instance, if your student prefers to get the challenging subjects out of the way first, plan homework time accordingly. In addition to helping your student adjust their schedule to lessen stress, encourage your student to schedule downtime. While it is important to dedicate time to homework, studying, and extracurriculars, setting aside relaxation time can be vital to reducing stress. Encourage your student to spend some time each day—even if it’s just 15 minutes before bed—reading, journaling, or doing some activity they find relaxing and enjoyable. Often, students will get so overwhelmed with projects and activities that they forget to factor any downtime into their schedule. Use the strategies you both developed during your discussions, and implement them into a plan of action for when your student experiences stress. Sit down with your student and go over these strategies so they feel more equipped when stressful situations arise. If your student experiences stress at school, inform your student’s teacher(s) of the situation. Explain that your student has coping strategies, and work with him or her to find ways these can be incorporated. If your student’s teacher understands the situation, he or she can be a great ally for your student if stress strikes during the school day. If your student experiences stress at home during study or homework time, implement breaks and positive reinforcement. Encouraging your student to practice good time management techniques can be another positive way to reduce stress. 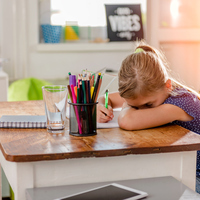 Often, students get stressed during tests or homework time because they feel rushed and fear they won’t complete the task on time. Developing time management skills can help your student feel more confident, and in turn less stressed, when encountering these situations both at home and at school. Stress affects everyone differently, so it’s important to understand your student’s individual needs. Have conversations with your student regarding what causes their stress and various ways to manage it. If your student knows they have you on their side, they can approach not only academics, but each aspect of their life with increased confidence. The University of Texas at Dallas, Bachelor of Science, Biomedical Engineering.